Atlanta’s postseason began with an authoritative 36-20 win over Seattle that avenged a 26-24 road loss to the Seahawks in Week 6. The Falcons scored 19 straight points against the Seahawks last weekend, turning a 10-7 deficit into a 26-10 lead. Matt Ryan added to his MVP resume with 338 yards and three touchdowns. Meanwhile, the Packers needed some late-game heroics after an early 21-3 advantage slipped away against the Cowboys. Mason Crosby connected on two +50-yard field goals in the last two minutes of the fourth quarter, including a 51-yarder as time expired. 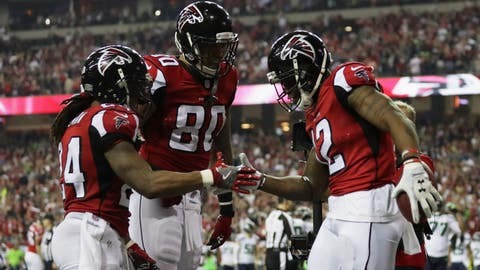 Atlanta and Green Bay are two of the league’s highest-scoring offenses, with the Falcons leading the way during the regular season at 33.8 points per game and the Packers in fourth with a 27.0 average. Aaron Rodgers will likely be without his favorite target, as Jordy Nelson has yet to practice since fracturing his ribs in the Packers’ Wild Card win over the Giants. Nelson’s absence didn’t seem to slow the Packers’ passing game in Dallas, though. Rodgers threw for 355 yards and two touchdowns against one of the league’s stingier defenses. In order to hang with Atlanta, the Packers’ offense may need to hit an even higher gear. In their last five contests — all victories — the Falcons are putting up an average of 38 points on the board. Will it be Rodgers or Ryan leading his team to the Super Bowl? According to our NFL simulation engine, the Falcons will come out on top in this matchup. Atlanta won 65.4 percent of simulations and outscored the Packers by an average of 27-23. The AFC Championship Game has been dominated by Peyton Manning, Tom Brady and Ben Roethlisberger over the last decade, so it only makes sense that the Steelers and Patriots will meet up with a trip to the Super Bowl on the line. The Steelers are coming off an impressive defensive performance against the Chiefs in the Divisional Round, while the Patriots rode Dion Lewis to a win over the Texans in order to advance. Though the Patriots and Steelers did meet up in the regular season, their Week 7 matchup at Heinz Field was spoiled by Ben Roethlisberger suffering an injury to his left knee in the previous week. Instead of a Brady vs. Roethlisberger showdown, we had to settle for Brady vs. Landry Jones. Not surprisingly, New England had the upper hand and never trailed in its 27-16 win. Both teams are red hot entering this one. The Patriots come in as winners of their last eight games while the Steelers are riding a nine-game winning streak. So who will win this marquee matchup between two of the most explosive offenses in the NFL? Our engine has the Patriots advancing 58.5 percent of the time, by an average score of 26-22.